Understanding the right ingredients is all important! Heloise wrote in her “hints” column that that best way to cook a moist turkey was to, “Put a cup of water in the cavity of the turkey, cover with tin foil and bake.” A reader wrote back to complain. “The turkey came out fine, but the plastic cup in the turkey melted!” Imagining that person trying to squeeze that cup into that turkey reminds us that directions must be specific! What are God’s specific directions for developing a thankful heart? What are the ingredients that result in thanksgiving? When was the last time you sent your boss a thank you note for that month’s check? Of course you don’t, you don’t generally thank someone for what you earned. That’s why recognition of God’s grace is such an important ingredient of thankfulness. When we recognise that all we have is a gift from Him it makes us into grateful people. “Righteousness” means that God ALWAYS does what is right. Beginning to get a glimmer of how righteousness ties in with thanksgiving? Sometimes life doesn’t feel like a gift - doesn’t look all pretty with a bright bow on top. 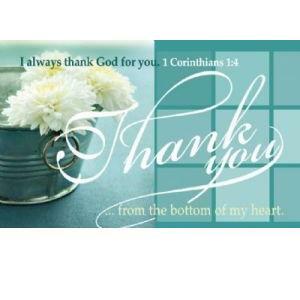 Thankfulness results from the knowledge that God is righteous. When life seems to have been unfair, when it seems when it seems to have cheated you, remember that God is righteous. His purpose will reign in the end. Of course you can and should give thanks all alone. But the truth is: if you don’t have a place to give thanks with others you’ll soon stop giving thanks at all. You need to hear others give thanks. You need to share what God’s doing in your life with others. Thankfulness is like bananas... it grows best in bunches. Family Activity: Start making a “Thanksgiving List” today, see how many things you can write down. Try to fill several pages.